You need animated GIFs to welcome visitors on your website or your PowerPoint presentation. To create successful ones easily, you can call on Ulead GIF Animator which has been designed by Corel. Ulead GIF Animator is endowed with a wide range of animations to create stylish and exceptional animations. You are given numbers of effects, you can add video or audio effects, transitions and also Photoshop compatible filters. Not only users are given the possibility to create GIF but can also export a wide variety of file formats. Here are some of them: Flash, AVI, MPEG and QuickTime. It is also possible to send self-playing animated greetings that you can personalize the messages and the music. One of its main features is to create dynamic multiple animations just by dragging and dropping the object. Its animation Wizards guides you through the process for creating GIFs. Once downloaded and installed, the application starts up with a cool looking design. Users can get around fast by using a simple tab-based interface in which optimize, edit and preview modes are possible. Ulead GIF Animator is ideal for creating fast-loading animations. 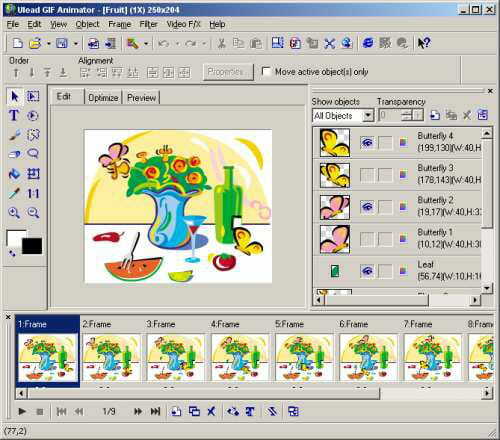 Ulead GIF animator is a shareware version that expires after 15-days of use. Latest update on November 20, 2016 at 02:37 PM.